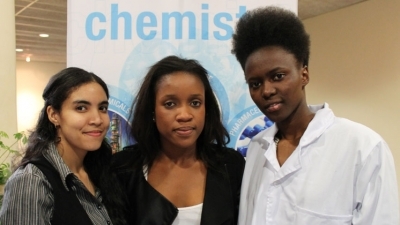 Third-year Chemistry students at CPUT battled it out for the coveted Idol title at this year’s Science Idols. The competition is an annual event hosted by the Chemistry Department and sees third-year students’ present research projects that they completed during their in-service training. The event ran over three days and saw 40 students present their projects to a panel of internal and external judges. At the end of each day, a number of students were eliminated, with only 10 going through to the final round, held at the CPUT Bellville campus. This year Chemistry student Ncumisa Matu’s research project won over the judges, earning her the Science Idol title. Ncumisa spent the year working on an innovative project that investigated the degradation of products of different grades of olive oil used for soap making. Ncumisa attributes her success to hard work, perseverance and a love for chemistry. “I love chemistry because it’s challenging and gives me the opportunity to exercise my thinking abilities,” she says. Student Jessica Heynes took second place for her project that explored sample preparations for determining the silicon content of beach sand, while Emile Nizeyimana, who researched elements of re-used cooking oil, was awarded third place. Head of the Chemistry Programme, Merrill Wicht, says she was impressed with this year’s projects.